Southcentral Foundation uses customer-owner feedback to support and drive all major decisions. The needs and wants of the people utilizing its services are sought out, heard, and integrated into every decision, structure, and process implemented within SCF. Alaska Native and American Indian people directly influence the system of care, either as customer-owners, or as employees within the system. Customer-owner is the term derived from this relationship. Nearly 53 percent of SCF’s workforce is made up of employees who are also customer-owners. This gives them an inside perspective of the way SCF operates; employees take part in the process of change, and go along on the journey to improving the ways in which feedback shapes every aspect of the organization. Customer-owners play a large role in their health care, from the wellness services they engage in, to the way they care for themselves at home. All customer-owners contribute to the innovation and improvement of SCF’s services by calling attention to the things that SCF does well, and identifying areas for improvement. So, how does SCF listen to and solicit feedback, you ask? SCF manages and uses listening post data and information to identify changing health care needs and to look for ways to improve and become more customer-owner focused. Listening posts include personal interactions, comment cards, surveys, 24-hour hotlines, conferences and events, social media, focus groups, and various other tools and touchpoints. SCF’s Customer Experience Committee is comprised of employees from across the organization, and uses this listening post feedback to measure the performance of the services provided. Through brainstorming sessions and researching best practices used by other organizations, including Baldrige award recipients, the customer experience committee provides recommendations and opportunities for improvement regarding the way SCF provides services. 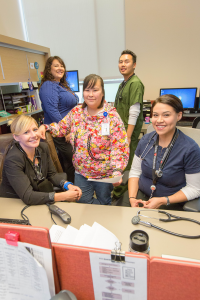 Through these mediums, and more, customer-owners both in- and outside of the organization work together to build a better health care system for Alaska Native and American Indian people. (907) 729-3299, or visit www.southcentralfoundation.com/contact.